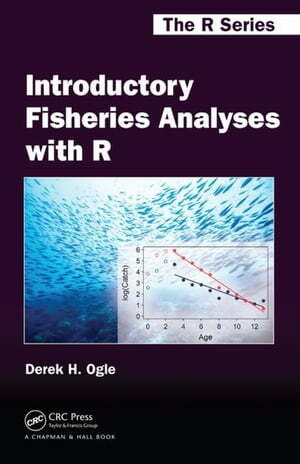 Collins Booksellers - Introductory Fisheries Analyses with R by Ogle, Derek H., 9781482235227. Buy this book online. Introductory Fisheries Analyses with R provides detailed instructions on performing basic fisheries stock assessment analyses in the R environment. Accessible to practicing fisheries scientists as well as advanced undergraduate and graduate students, the book demonstrates the flexibility and power of R, offers insight into the reproducibility of script-based analyses, and shows how the use of R leads to more efficient and productive work in fisheries science. The first three chapters present a minimal introduction to the R environment that builds a foundation for the fisheries-specific analyses in the remainder of the book. These chapters help you become familiar with R for basic fisheries analyses and graphics. Subsequent chapters focus on methods to analyze age comparisons, age-length keys, size structure, weight-length relationships, condition, abundance (from capture-recapture and depletion data), mortality rates, individual growth, and the stock-recruit relationship. The fundamental statistical methods of linear regression, analysis of variance (ANOVA), and nonlinear regression are demonstrated within the contexts of these common fisheries analyses. For each analysis, the author completely explains the R functions and provides sufficient background information so that you can confidently implement each method. The author's website at http://derekogle.com/IFAR/ includes the data files and R code for each chapter, enabling you to reproduce the results in the book as well as create your own scripts. The site also offers supplemental code for more advanced analyses and practice exercises for every chapter.